When it comes to finishing hardwood floors there are many different techniques that can be used to give the floor a dynamic look and restore it to its former glory. One such technique is the use of oils. One of the most popular oils for refinishing a hardwood floor is Tung Oil. This particular type of oil is well known for transforming a dull, lifeless hardwood floor into something you can be proud of in your home or office. Here is a quick overview of how oil refinishing works to make your hardwood floor look its best. First you’re going to want to clean the floor to make sure that any dust, dirt or other debris are removed from the area. This is incredibly important so make sure you’re using a heavy duty solution such as trisodium phosphate. Once the area has been thoroughly cleaned let it dry completely before moving on to the next step which will be sanding. When it comes to sanding the floor you’re going to want to use something along the lines of 150-grit sandpaper. This is to open up the surface without causing major damage to the wood. The goal here is to open up the surface of the wood so that the oil can soak throughout the hardwood floor. Make sure you use a dry mop or a dry cloth to go over the surface to clear away all the dust. Now it is time to add the oil. Some oils like Tung oil will need to be mixed with a thinner. This is so that the oil will have an easier time soaking into the floor. You will usually need to apply at least 3 layers waiting about 20 minutes between coats. If you notice that the oil is not soaking into the wood try adding more thinner. Once the final layer has been applied wait another 20 to 40 minute then go over the floor with a lint-free cloth. Once you’ve gotten all the excess oil you should then wait 24 hours before moving on to the next step. The next day you’re going to want to repeat the process of adding oil to the floor. 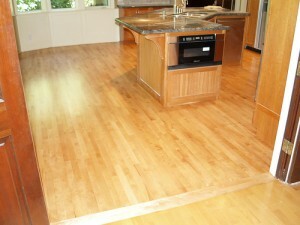 The cleaning and sanding aren’t necessary this time, just do it like you did previously until the floor looks glossy. When you’re done once again go over the floor with a lint-free cloth. Now you’re going to need to apply wax paper to the floor to protect it while it dries for 7 to 10 days. This may seem like a long time but you have to give the floor enough time to thoroughly soak up the oil and dry. It would also be wise to block off the area from any pets or children if you’re doing this at home.